A 15-year-old work experience student from south London was left in charge of Southern Rail's Twitter account on Tuesday. And for a feed usually dominated by the complaints of angry commuters, things soon turned pretty surreal. The teenager introduced himself on the social network at just after 2.30pm. Within moments Southern Rail's 161,000 followers were tweeting Eddie questions. 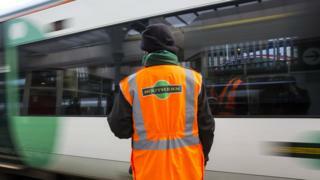 Probably a welcome change for the beleaguered rail firm, which has faced months of criticism from customers for cancelled services and strike action. A bitter dispute over the role of guards has affected Southern passengers for more than a year. Eddie was quick to respond to the hypothetical duck vs horse question. Eddie continued tackling a variety of topics such as football and his GCSEs, and answered a question on how he secured work experience at the rail company from someone wishing to do the same. "I applied through a friend that worked here, although if you DM us your email address we can forward this onto HR." "Hi, I don't play a great deal but when i do it is usually FIFA," Eddie replied. But it was his response to a random question about whether a boy could swim faster than a shark that earned the teenage schoolboy the kudos all social media users crave. "Hi, I don't think so but you never know there could be a girl that can," Eddie responded, prompting replies of "great work Eddie" and " I love you". Occasionally a tweet by one of Southern Rail's regular Twitter team, named Neil, appeared on the feed in response to customers unimpressed by the online discussions. "Nobody wishes to troll a 15 year old, but Eddie should be made well aware how lives are being ruined by GTR," remarked one Twitter user. "We're showing a 15 year old the wonderful world of work today. Appreciate if you could lay off the abuse for a bit," was the response. Other hypothetical questions followed as did Eddie's quick responses. "Rollerblades for feet." Eddie replied. "I feel like I would get used to them pretty quickly and be able to get places quicker!" While another Tweeter joked: "And you'd get there faster than on a @SouthernRailUK service too." A spokesperson for Southern Rail said Eddie would be back on Twitter duty on Wednesday. "We had planned for him to sit with our control team tomorrow and learn about train planning, however he loved his time on Twitter today and he clearly has a natural talent for it so he will most likely be paying us a visit tomorrow."